You hear the phrase "koozi sham" and the first thing to come to mind might be a product sold through late-night television infomercials. In fact, Koozi Sham is a pot pie of sorts, with origins across the Middle East, its size and shape reminiscent of a curling stone -- and, I'd argue, more worth your money than any of those "As Seen on TV" products you might be tempted by. 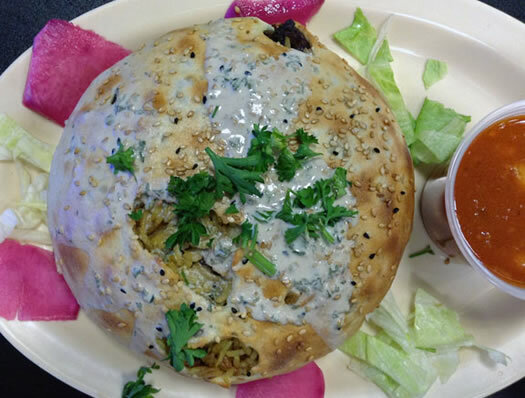 It's also a rare dish of sorts; I'd never before seen it on the menu at a restaurant until I visited Oasis Mediterranean CafÃ© in Albany for the first time. But it's the kind of dish that is satisfying not only due to its size, but because of the complexities of tastes and textures it provides. 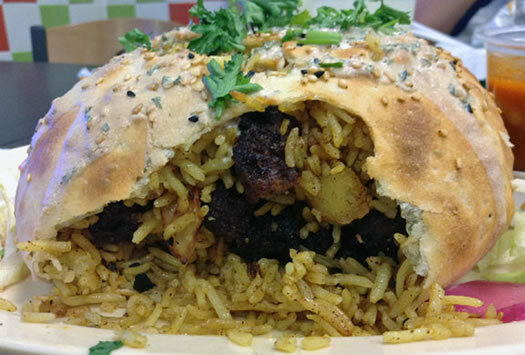 To find out more about the thought process behind adding the Koozi Sham to the menu at Oasis, I spoke with Ali Al Alusi, the owner of the restaurant, which opened earlier this year in Albany. Though the dish is Turkish in origins, it's advertised as Syrian at Oasis. The word "sham" refers to the Damascus region in Syria, "koozi" means "something enclosed," according to Al Alusi. "Back when the Ottoman Empire expanded and took over the entire Middle East, it passed through into Syrian cuisine and there were changes to the spices and seasonings," explains Al Alusi. Some of those changes can be seen in the version made by Oasis chef Zaid Albaker. That secret blend of spices imparts a rich, earthy flavor throughout the Koozi Sham, brightened by a hint of cinnamon. At Oasis, they roll out their own dough in the kitchen and then stuff the shell with a variety of ingredients, including some that can be tailored to the diner's preferences. The main part of the filling is basmati rice, long grain and cooked to a perfect al dente texture; this provided a light nutty flavor to complement the spices. While beef or chicken are the most common featured elements of the Koozi Sham, Oasis is happy to provide substitutions such as chickpeas or eggplant for vegans and vegetarians. I chose beef, and found the pot pie to be generously filled with bite-size chunks of it -- reminiscent of gyro meat in terms of taste and texture, with a bit of crust similar to the effect of being cooked on a griddle. The variety of elements in the pot pie is enjoyable both in terms of taste and texture; along with the rice there are potatoes and grilled onions, which add textural contrast and depth of flavor. 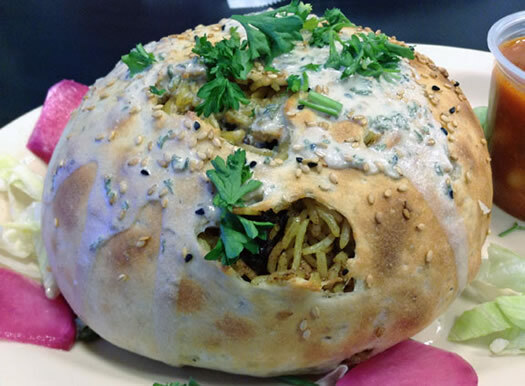 Black and white sesame seeds cover the top of the shell of dough, along with a drizzle of tahini sauce, which adds a hint of sourness to balance out the richness of the Koozi Sham's filling. Oasis maintains just a small storefront on Delaware Avenue, just south of the main Lark corridor, which is "more of a takeout style restaurant," according to Al Alusi, though there are a handful of tables and the interior of the restaurant is bright and pleasant. It's hard not to be charmed by both the food at Oasis and the owner's optimism and determination. Al Alusi was born in Atlanta, Georgia, and has lived in a dozen states since then, and says he was living in the Middle East when he met the chef, Albaker, who he describes as "[his] brother" prior to coming to Albany. At first he wasn't sure that a Mediterranean restaurant would be right for this area, but he hit the streets to find out. "I spent three months working on the menu," Al Alusi says, in the process paying close attention to locals he surveyed. In the end, he took an initial menu of 27 items and streamlined it down to the current 15, finding a positive response from customers. Al Alusi has found Albany to be an excellent locale for his new business, particularly with the recent growth in technology and education in the area. "I see this town growing and expanding, and we might as well grow with it." Jeff Janssens writes about food beer at The Masticating Monkey. I've been to Oasis a bunch of times in the last few weeks and they haven't let me down yet. Their falafel and shawarma have been excellent, as well as their sides. I definitely have to give the koozi sham a try! 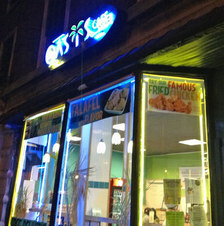 Also, I am thrilled that Oasis is more of a 'takeout style restaurant'!! Places that are geared toward dining-in may still have takeout as an option, but their menus are always still priced for dining-in. This is really annoying to me. The more good takeout-friendly places, the better!! What? Was I in a coma for the first part of this year that I didn't know a new Mediterranean/Middle Eastern joint opened on Delaware Ave? My favorite food! That dish sounds SO GOOD! I have also been thinking about where to buy shish-kebabs. My only concern is parking. Thanks so much for this. I can't believe this place has escaped my attention so far. Those pictures and your description are making my taste buds go crazy imagining it! @ Laura: I think chrisck is right and that it's made with wheat flour, but I'd check with the restaurant--they seem very eager to accommodate everyone who walks through their doors. @ Paul: I agree with you on with the pricing seeming reasonable at Oasis. And it's not a bad place to sit in and eat, too, if you're like me and not living near that part of town. @ chrisck & Ryan: I was right with you on driving past it, completely missing Oasis for the longest time. I think it has to do with where it's located in relation to the Lark/Madison intersection; it's always a little crazy going through there so it's easy to miss everything around you. @ mg: Parking certainly can be tricky, but last time I was there in the evening I pretty easily found a spot right on Jefferson, I believe. But I do believe it's worth that bit of hassle! Had the falafel wrap tonight. It's tasty (though I'm also a big fan of Mamoun's falafel so I felt a little like I was cheating on them) and also it's HUUUUGGGEEEE. For $6.40 it was so big (long actually) that it could easily be cut in half for two people to enjoy for lunch or dinner. I figured out why I missed this place. It happens they also serve a fried chicken menu (and there seemed to be a brisk neighborhood business for that) and whenever I'd drive by all I saw was the signage for fried chicken, not the Middle Eastern fare. They need to promote the latter more (this blog was a big help) because it'll attract a wider clientele. I've driven past it dozens of times and didn't understand what kind of place it is. I found a parking space (around 8 pm) a couple of streets away. During the day I think the new parking regs will mean more available spaces (or so I've found in the last couple of months -- no problem finding downtown parking in the zones with the parking permits). So if you are worried about parking, try going there during the day. JEFF. I owe you big for this. I can't wait to try this, I've never SEEN or HEARD of this dish before! Oasis has closed, according to a post on a Hudson/Park neighborhood forum. I know the hours had been increasingly irregular in the last few months.